Our commission for 2018 is The Ways of the Wild by Maria Whatton and Sarah Matthews. How many warriors does it take to create a champion? Two to be precise. Two warrior women who have courage enough to outwit an army and fly through fire. These are the caretakers of Fionn Mac Cumhaill, the Irish champion, who owes his skills and spirit to his mighty “Aunts”. Have you the heart and stomach to be mesmerised by this magnificent adventure? Are you ready to learn the ways of the wild? 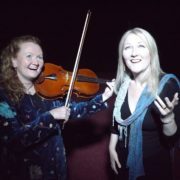 One of Ireland’s greatest legends brought vividly to life by the delightful duo: Storyteller Maria Whatton and Musician Sarah Matthews. New venue and dates to be confirmed soon.